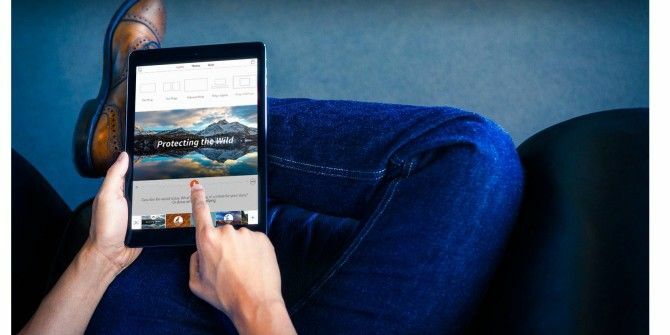 Yesterday digital media solutions company Adobe released Adobe Voice, a self-contained story telling production app for the iPad. Similar to PowerPoint and Keynote, Adobe Voice allows users to create a voice narrated slideshow on the iPad. The app includes a collection of over 25,000 searchable stock icons and photos, plus thematic layouts with background music. In addition, users can choose from a wide assortment of fonts and colors, as well as import their own photos and graphics. Project slides appear in a timeline, with automatic motion effects, where they can be duplicated and rearranged, and their individual duration can be changed. While the entire presentation can be produced in Adobe Voice, voice narratives should probably be written first and read one or two lines at a time for each slide, by holding down the record button in the app. The app’s homepage includes a collection of sample projects, and new projects can be based on one of over a dozen projects ideas for business or instructional presentations, greetings, personal stories, story tales, or school related projects. Users can also choose one of several types of story structures, such as Show and Tell, Share a Growth Moment, Teach a Lesson, Share an Invitation, Promote an Idea, or Follow a Hero’s Journey. Users can share private links to their projects, or projects can be shared in the Adobe Voice gallery, as well as to social networks, and links via email and text message. Production credits for productions can also customized. Adobe Voice for the iPad is a free download, and requires iOS 7.0 or later. ipad? what about other platforms. It doesn't mention any other platforms. I'm sure an Android version is in the works.